A crown court in Newcastle, UK has sentenced a Dutch salvage company to a fine of nearly $320 million for illegally scrapping a WWI-era shipwreck in the Celtic Sea. In August 2016, the Royal Navy vessel HMS Severn was on patrol around the Isles of Scilly when she was tasked to investigate the movements of the Dutch-registered salvage ship Friendship. Severn's crew found the Friendship lifting steel and copper from the bottom with a grapple. This scrap came from the wreck of the SS Harrovian, a steamship that was sunk by a German U-boat during WWI. The Severn launched a boarding party, and when the crew came aboard the Friendship, they found that the vessel's master did not have a salvage license for the $115,000 in metal on board. They put a scratch crew together, impounded the vessel and sailed her to the port of Fowey, where she was handed over to the UK Maritime Management Organization. Prosecutors pressed charges against the Friendship's captain, Walter Bakker, and shipowner Friendship Offshore BV for three unlicensed salvage operations at the wreck site. 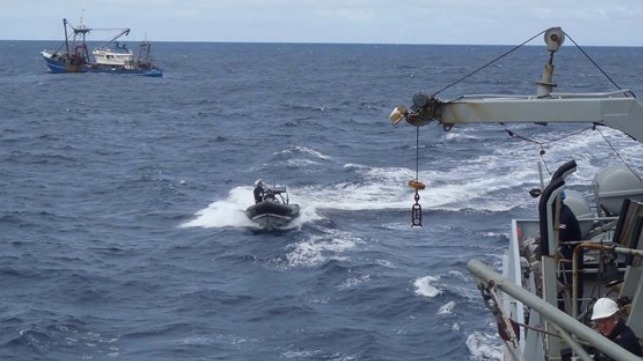 In the course of the trial, Bakker admitted that he did not have the relevant marine licence and showed how he had manipulated the vessel’s Automatic Identification System (AIS) in order to avoid detection. After an 18-month trial, the prosecution won their case and secured steep fines and penalties for the owner. The master also received a small fine of about $2,600.